To let your dad know how much you love and appreciate him you can send him some of our specially designed flowers and gifts from Stirling Flowers. 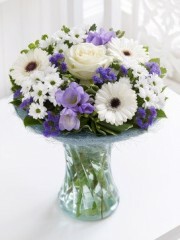 We have flowers and gifts that are especially designed to send to your dad on this occasion. Stirling Flowers Delivery service means you can have your flowers delivered to where ever your dad may be, we can personally deliver your flowers around Stirling and can also take order to be delivered elsewhere both in the UK and abroad too, with over 140 countries, our network of florists can provide flowers for just about anywhere! Stirling Flowers have beautiful wine in red, white, rose and sparking rose so you can spoil your dad this Father’s day. We even have Champagne so you can really celebrate in style and make this father’s day one he’ll never forget. Stirling Flowers dedicated team work hard to create all the orders in the perfect way so your dad will feel special this Fathers day. Stirling Flowers also have chocolates, plants and balloons all of which we can deliver directly to your dad to make him feel appreciated and loved.